Will you see snow, sleet or rain out your window tomorrow? Storm Team4’s chief meteorologist Doug Kammerer said the answer depends on where you live. Snow began falling Monday evening and will continue to fall at a steady pace overnight. Expect 1 to 3 inches of snow in D.C., 3 to 6 inches in the north and west suburbs and 6 to 10 inches further north and west. 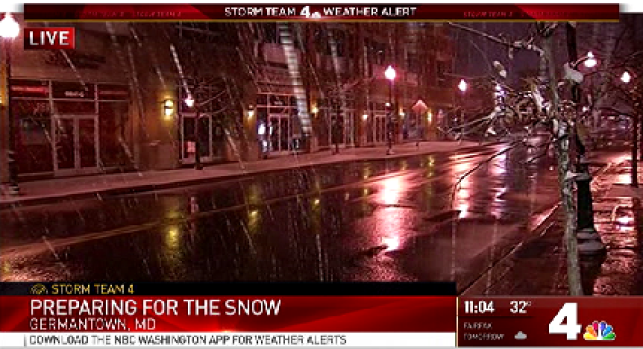 A winter storm warning for most of the D.C. area will start at 7 p.m. Monday and last until 2 p.m. Tuesday. How much snow will you get in the nor'easter that is sweeping up the East Coast overnight? Depends on where you live. Areas south and east of the District -- including southern Maryland -- may see some snow to start, but it will quickly change to sleet and rain. But north and west of the city -- including parts of Montgomery and Frederick counties in Maryland -- is in for much more. Storm Team4 is calling for 3-6 inches in the closer-in northwest suburbs, and 6-10 inches farther north and west. Close to the Pennsylvania line, communities could see 10 inches or more of snow. The storm led some school districts and universities to cancel Tuesday classes, though many large districts have opted to wait for tomorrow morning. Federal workers also don't know yet if they will be allowed to stay home; the federal Office of Personnel Management said it would not make a decision until early Tuesday morning. But Metro is already changing service, as is Amtrak. Scores of flights were cancelled, especially those headed northeast, where a blizzard warning has been issued for a swath of the East Coast stretching from Philadelphia to Portland, Maine. Snow will begin falling Monday evening, with most of the area seeing snow by 10 p.m. The heaviest amounts will accumulate between midnight and dawn Tuesday along the I-95 corridor and to the west of it, said Storm Team4 Chief Meteorologist Doug Kammerer. Snow will likely change to a mix of snow, sleet and rain in the early hours of Tuesday along I-95 and east of it. It will change back to snow Tuesday morning as the cold air wraps around this storm system. For more weather details and hyperlocal radar, click here. Most accumulation will end by about noon Tuesday, but some snow showers could continue Tuesday afternoon. 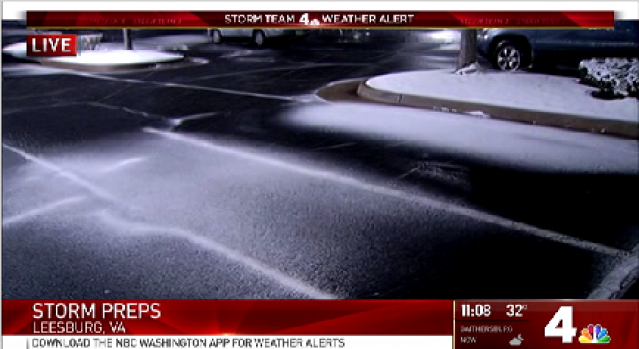 In southern Maryland, the storm will mostly be a rain event, according to Storm Team4. It may start with a little snow on the ground, but will just be rain by Tuesday morning. The National Weather Service issued a winter storm warning for most of the D.C. area from 7 p.m. Monday to 2 p.m. Tuesday. A winter weather advisory is in effect during the same time period for Stafford and Spotsylvania counties and Fredericksburg in Virginia and Prince George's, Charles and Anne Arundel counties in Maryland. Areas north and west of D.C. know what it's like to be in the bull’s-eye of storms. 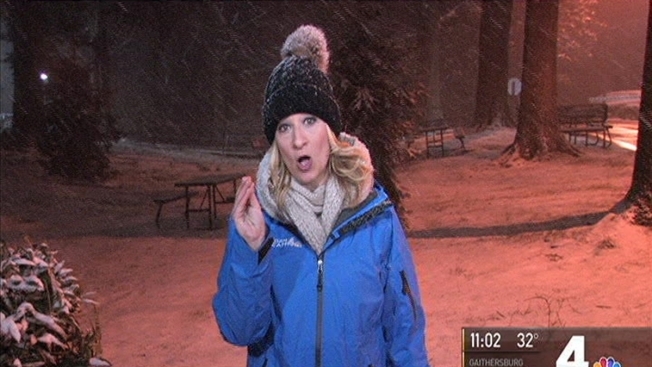 News4’s Jackie Bensen was in Leesburg, Virginia, with a look at conditions. "This storm will have significant impacts. It's going to be a heavy, wet snow that will lead to power outages," Storm Team4 Meteorologist Amelia Draper said. Temperatures Tuesday afternoon will likely climb into the upper 30s, so fallen snow will turn slushy as it melts during the afternoon and evening. But the rough weather won't end there: Wednesday is looking windy and bitterly cold, with an expected high of 30 degrees and wind chills in the single digits. That means refreezing will remain a threat to the region's roads for much of the work week. News4's Shomari Stone spent Monday night in Frederick and Montgomery counties as people hunkered down for the storm. Gov. Larry Hogan (R-Md.) declared a state of emergency, urging Marylanders to use common sense and stay off the roads. Counties, such as Montgomery County, Maryland, which may see relatively little in communities near the northwest D.C. border but far more in Germantown, have a challenge with the changing forecast. So local governments are preparing, salting the roads and calling out snow teams. "We don't really know at this point how much this will affect the District," Mayor Muriel Bowser said at a press conference, ringed by District leaders in charge of roads, city services and Metro. "We are hoping for the best but as you can see ... all the people behind me are planning for whatever Mother Nature sends our way." She was called to the White House to discuss snow preparations with President Trump. In D.C., more than 200 plow trucks were deployed by 7 p.m. Monday; salting streets began on Sunday. In Maryland, crews began pretreating streets and highways on Sunday with a mix of brine and beet juice that slows ice forming on roads. They pretreated major roads and residential routes with rock salt and brine on Monday. Virginia Gov. Terry McAuliffe declared a state of emergency, allowing state agencies to assist local governments in preparation and response to the storm. “With this forecast in mind, all Virginians should take the necessary precautions now to ensure they are prepared for travel disruptions and possible power outages during a cold weather period,” McAuliffe said. Many institutions closed for Tuesday, including the Univeristy of Maryland at College Park and Georgetown University. So did school districts where buses have a long way to go on rural roads, including Loudoun, Prince William and Fauquier counties in Virginia and Frederick County in Maryland. For an always-updated list of closures, click here. The U.S. Office of Personnel Management tweeted that it will determine early Tuesday whether federal employees in the D.C. area will have a snow day, the agency said Monday afternoon on Twitter. "Next call is at 3 am, decision by 4 am," the tweet said. Based on today’s region wide conf call; still much uncertainty on rain/snow line & accumulation. Next call is at 3 am, decision by 4 am. Government leaders said everyone needs an emergency plan and to use their common sense. "Don't let the recent mild weather fool you -- it's still winter and this storm is coming," said Gov. Larry Hogan. The Maryland Emergency Management Agency is telling drivers to stay off the roads during the height of the storm so crews can easily clear highways. Be cautious shoveling snow or ice to avoid overexertion. Take frequent breaks and keep hydrated. If you must travel, make sure to have car chargers, kitty litter or sand for traction. Let friends or family know of your travel route and expected arrival time. If it is safe to do so, consider clearing off roofs if significant snow has accumulated. Know how to contact your power company in the case of a power outage. Officials are advising property owners to spread rock salt, deicer or non-clumping kitty litter on sidewalks to prevent slips and falls. Metro will operate on a Saturday schedule Tuesday, running fewer trains to allow for plowing and safety checks. Metrobuses will begin the day on a severe snow service plan with limited routes on major roads. MetroAccess service was suspended as of 4 p.m. Monday and all day Tuesday due to the impending winter storm. Service will be restored when it is safe to do so. However, a time for service restoration is not yet known.